A COUPLE of months ago, I looked around MilliOnAir HQ and had an epiphany: over the past year since launching my global digital magazine, I have been blessed to have an amazing team supporting me behind the scenes. Blessed and grateful beyond words right now. We are working even more magic this month, as we go out to more than 20 million readers. Not bad, for a small but enthusiastic team producing a fast-growing and truly inspirational luxury boutique online magazine. In this issue we have even more video content and it is no secret that this amazing medium is proving popular to so many readers and advertisers alike. In the next two years, video content will be the driving force behind 85 per cent of search traffic throughout the world with Snapchat, Instagram and Facebook growing in even greater strength. But it is important to understand how each social channel is optimising its platform to allow for more video content in users’ feeds and how brands are using video content to engage their followers. So we are excited to be sharing more and more videos from our wonderful clients. 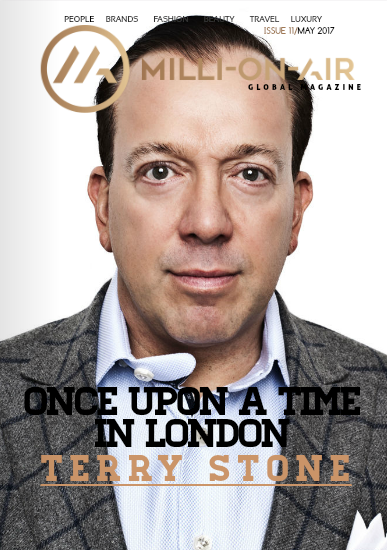 We visit the set of Once Upon A Time in London with our cover star and MilliOnAir friend, Terry Stone. Read his inspirational story on Page 44. Also, we have fashion from Rocky Gathercole, stunning escapes with Melanie Layer, beautiful art by Lincoln Townley plus luxury cars and did I mention – stunning video content! I trust you will have as much pleasure reading- and watching – this issue of MilliOnAir Global as we enjoyed compiling it for you.